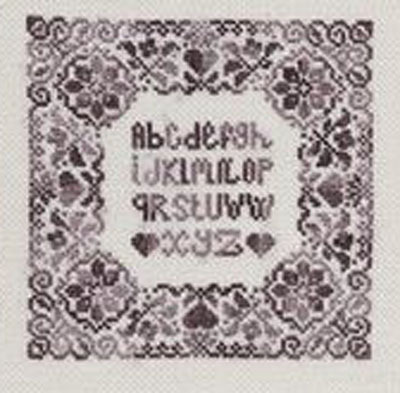 "Arabesque, Alphabet n°1" is a cross-stitch chart with instructions translated in English. It is the first design of a new Tralala series to be collected. This pattern is worked as a monochrome with a single shading thread. You can choose your own colour. The designer has recommanded to use a silk thread from ATALIe called "Soie Balbek" (there is no counterpart in DMC reference on the chart). ATALIe threads are shaded hand-dyed cotton (or silk) threads by French designer ATALIe; their subtle shading gives a special outcome to your stitching. We advise you to buy the mini-pack of ATALIe threads we have prepared to match this pattern. See below the "related products" section to buy the right mini-pack of ATALIe threads. You will need 1 pack of threads if you choose to work this design as a miniature or 4 packs if you prefer to work with 2 strands of cotton over 2 threads of fabric. The model on the picture has been stitched as a miniature on a 32 count linen fabric (colour "Platinum") using one strand of cotton over one thread of fabric. Recommended fabric: 32 count Zweigart linen (ref Belfast colour Platinum, see "related products" below) 35x35 cm (14 x 14 in) or fabric of your choice regarding the type and stitch count, colour "white" "ecru" or "off-white"